Steve Lawrence introduced Graeme Joy. Graeme was the joint leader and navigator of the International North Pole Expedition where he became the first and only Australian to ski to the North Pole.. In this presentation he discussed his North Pole adventure and explored how to be successful as a team of eight people making it to the North Pole. The journey to the North Pole started at Cape Columbia. The straight line distance from there to the North Pole is 860kms. The team travelled over 1100kms to get to the Pole as a result of sea ice movement. Temperatures at the start of the expedition were -60 degrees. Graeme presented some of Jim Collins‘ ideas about sustained performance. These included setting a BHAG (big hairy audacious goal) for the Pole expedition. Graeme cautioned about idea assassins. The more vocal of whom appear to know least and mobilise failure information. Graeme discussed personality types and team membership. He identified: drivers, amiables, expressives, and analyticals. He pointed out that we are attracted to people with whom we get along but it is difficult to build a team around this attraction. He considered how directed responsiveness and directed assertiveness were components of the team environment. Graeme pointed out that teams needed variety of preferred styles to enable agility in decision making. The three members of the leadership team were: a driver/driver; an analytical; and an expressive/driver. Three leaders were chosen to avoid one leader’s burnout over a two month period. in the team. It was decided also not to change leaders regularly in a democratic way to avoid constant change in the team’s atmosphere. A team of three provides a sustainable style. Graeme noted that Level 5 leaders: were ambitious for the team; sustained results; committed to whatever it takes; and accept full responsibility. The team that went to the Pole was selected over a seven month period. The three expedition founders people made the first team choices and thereafter the team was built with ongoing inclusion in decision making. The remaining five members of the team were: expressive; analytical/driver; analytical; amiable/analytical; analytical/driver. Graeme believes that “we put the right people on our bus”. Team members had the same view of the same expedition. Graeme provided details of how the team trained for two years to get ready for the expedition. 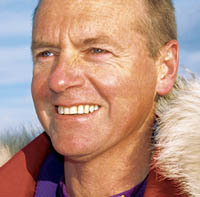 He provided examples of training in rough ice (there were 2500 pressure ridges between the start and end points of the expedition which equated to climbing Everest from sea level) and the need to minimise all weight carried or dragged (including an eight-man tent weighing 1.5 kgs per person load). The team slept out of the tent in training to prepare for damage to the tent in the expedition. Graeme discussed deliberate practice (Anders Ericsson) in this context. The aim of training was to address the brutal facts of the journey: recognise the real truth; acknowledge a step by step approach; and to confront real. The Ericsson-inspired approach to training meant that the team spent a great deal of time on ridge ice. They used immediate feedback and continuous improvement. Graeme observed that “rough ice not pleasant but we got through it”. On the ice you can move backwards by going forwards. But can you move forwards too. Graeme then turned his attention to making mistakes in training. He suggested these mistakes occurred either because the individual does not know enough or conversely you know it so well you do not pay attention to detail. An example of the latter is a frostbite blister one of the team members developed in training. The expedition did receive regular deliveries of resources by plane. Ice splitting example. Each plane drop costs $45,000 and therefore required some skilled people at the home base to ensure all materials were packed for each drop. The provisions were resourced, packed and shipped by an analytical type. Medical tests were conducted throughout the trip. Graeme shared some images of the frostbite dangers in the trip and the need when necessary to have whole body washes with medicated soap. Graeme gave some examples of what if training that proved valuable particularly for wayfinding with a sextant when GPS systems froze. Within the expedition there were opportunities to resolve conflict and Graeme gave an example of an Amiable and Driver interaction over nutrition. He noted that during conflict individuals revert to their strongest personal style. Other team members defused this conflict by addressing the team’s agreed goal and then discussed what (if anything) had changed. The problem was resolved by communication. Graeme then discussed the role courage plays in forging a team. He noted that the team increased its workload to 12 hrs per day for 20 days. This involved moderate risk taking and a chess game with contours and fissures in the ice. The terrain bred a culture of discipline in thought and action. Fissures in the ice require teams to work together to advance on the ice.